Heat oven to 425°. Prepare Pastry for Two-Crust Pie. Mix sugar, flour, salt, cinnamon and nutmeg in medium bowl. Add tomatoes, lemon peel and juice; toss. Turn into pastry-lined pie plate; dot with butter. Cover with top crust; seal and flute. Cover edge with 2-3 inch wide strip of aluminum foil to prevent excessive browning; remove foil last 15 minutes of baking. Bake until golden brown, 35 to 45 minutes. Serve warm. Cut 2/3 cup plus 2 tablespoons shortening into 2 cups all-purpose flour* and 1 teaspoon salt. Add 4 to 5 tablespoons cold water, 1 tablespoon at a time, mixing until pastry almost cleans sides of bowl (1 to 2 tablespoons of water can be added if necessary.) Gather pastry into a ball; divide in half and shape into 2 flattened rounds on lightly floured cloth-covered board. Roll 1 round 2 inches larger than inverted 9-inch pie plate. Fold in quarter ans place in plate as pictured. Unfold and ease into plate. Roll second round. 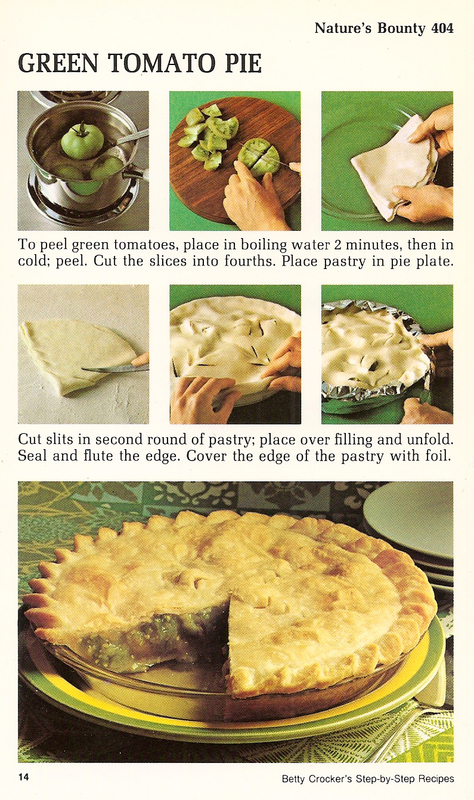 Fold into quarters; cut slits so steam can escape. *If using self-rising flour, omit salt.